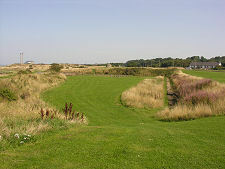 Prestongrange lies on the south shore of the Firth of Forth between Prestonpans to its east and Musselburgh to its west. In an area whose economy is increasingly turning to leisure, Prestongrange is a real relic, a second-hand landscape that still carries the signs of industrial use and re-use over many centuries. This makes it very easy to overlook by those following the coastal road here. Which is a shame, because Prestongrange played an important part in the story of the industrial revolution in Scotland. Coal had been mined locally since medieval times, and salt had been panned (using fires powered by the local coal to aid evaporation) for nearly as long, all along this coast. In the 1500s a harbour was constructed, and an important glassworks was established here in the 1600s. 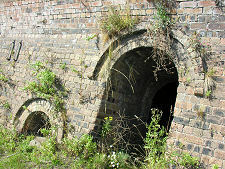 In the 1700s and 1800s the site was the location of pottery kilns, and in the 1800s and 1900s a brickworks and a colliery were established here. Today these industries are all gone, but reminders of them remain. 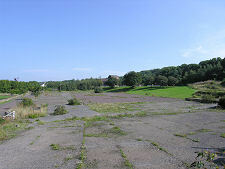 Nature is doing an enthusiastic job as it tries to to reclaim an area that was lost to it for centuries, but a number of the buildings from the brickworks and colliery still remain, if now appearing slightly lost amid what would once have been a hive of activity. 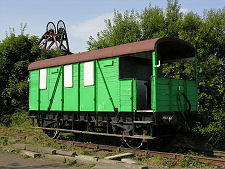 This legacy is in the care of the Prestongrange Museum, whose aim is to give visitors an opportunity to explore this fascinating area, to find out more about what actually remains on the ground, and to attract the funding needed to put in place a programme of preservation and restoration. 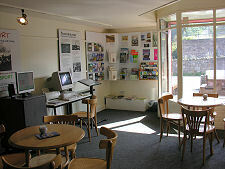 For the visitor, the museum is accessed from the west (Musselburgh) end of a loop of road on the inland side of the B1348. The industrial site is accessible at any time, and information signs detail how you can guide yourself round an audio tour using your mobile phone to pick up information at each of a number of different points. You can also download the audio tour from their website for your MP3 player. 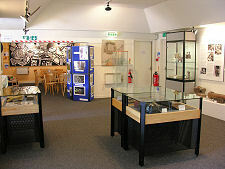 The visitor centre is open from April to October. Here you can pick up a free leaflet about the tour, explore the information and exhibits on view, take advantage of the cafe, or just enquire about guided tours of the Cornish Beam Engine. 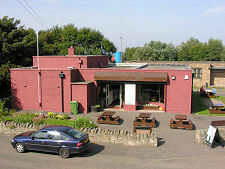 The visitor centre is located close to the most obviously complete building when the site is seen from the main road, the pit head baths from the Prestongrange Colliery, complete with a number of murals reflecting times gone by. 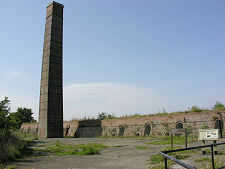 From here you walk across the site of the brickworks, now no more than concrete platforms at ground level broken through by weeds, before climbing a few steps and walking west towards the multiple mouths and imposing square brick chimney of the Hoffman Kiln. This is a real rarity in Scotland. It was built as a "continuous kiln" in 1937, the pinnacle of a process of automation of the brick making process that would have allowed 5 million or more bricks to have been produced here each year. From the kiln you walk east towards two other buildings still standing complete on the site. En route you pass the quietly eroding remains of winding machinery before arriving at a fenced off area beyond which is a complete winding engine. But your attention is grabbed by the nearby three storey sand coloured stone building. 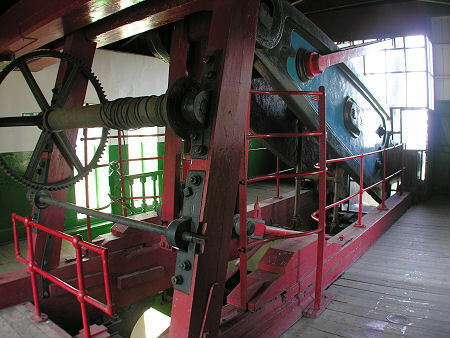 This is the Cornish Beam Engine, installed here in 1874. 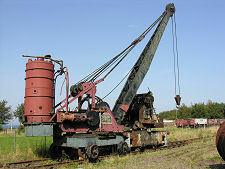 Its role was to pump water up from the 420ft (128m) deep coal seam, allowing mining operations to take place at all. 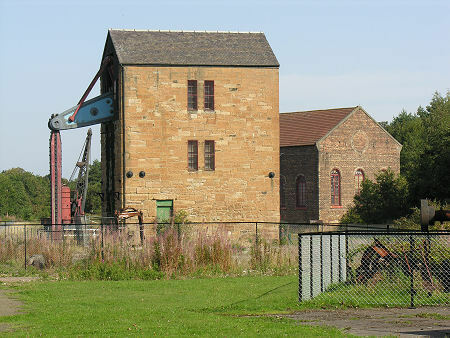 The beam engine was capable of pumping 4.5 million litres per day out of the colliery. If you get the chance to tour the beam engine, you should take it. What becomes immediately obvious is that the building does not so much contain the engine as form part of it, sheltering the main mechanical parts from the elements. Getting this close to such a vast piece of machinery is an awe inspiring experience. Beyond the Beam Engine is the Power House. 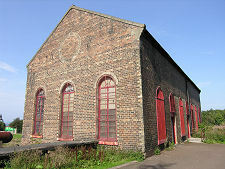 This once housed the steam engines that produced all the power needed in the colliery. Today it is used as a home for a series of temporary exhibitions, and is well worth a look. Evidence of earlier uses of the site is much more difficult to see on the ground. 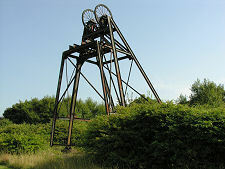 But if you make your way from the Power House towards the pit head gear visible rising from the bushes to the north, you will be walking across the old glassworks site. And the cottages you reach a little short of the main road may have been associated with the pottery industry that once thrived here. Cross the main road and make your way across the grassy area to the shore. Here you can find the still clearly visible outline of Morrison's Haven, the harbour built in about 1530 and only filled in during the 1950s as a hazard. 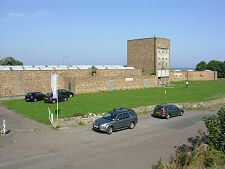 While here it is worth looking west along the coast: any impression that all industry has left the area is dissipated by the view of the ash lagoons, fed by Cockenzie Power Station, that effectively cut off the east side of Musselburgh from the coast.